in PNG donation of K1.3 million. 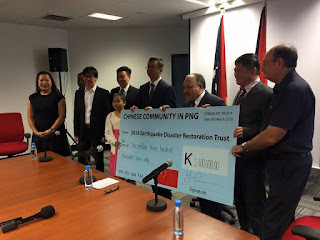 The Chinese Business Community in PNG have come together to make a kind donation of K1.3 million to assist victims of the 7.5 magnitude earthquake in some parts of the highlands region especially Hela and Southern Highlands Province. While the death toll and destruction continue to mount, it is a relief to know that at a time of need, we have friends from abroad as well in the country who feel our pain and are willing to help in such occasions. The donation from the Chinese Business Community will go towards the Relief and Restoration Trust Fund that PM Peter O’Neill announced yesterday.